Leading Me in Peace | GetAlongWithGod.comGetAlongWithGod | A blog about discovering a God worth knowing. As a follow up to my last post, I’d like to go back to discuss my time as a shepherd. I know I do this every so often, and I pray it doesn’t get old. I learned so much in the field that has translated into my daily life. Today I’d like to reference my experience by saying that a shepherd leads in peace, not chaos. When I shepherded sheep and goats, I had to always sow peace among the flock. I had to move slowly and deliberately, I had to speak quietly and calmly, and I had to handle them with patience. If I were riled up it would transfer to them by osmosis. They would just read the room and take on my emotions. If I were angry, they would become skittish and frightened. If we’re being shepherded by our God through listening and following the Spirit, that is evidenced in our having peace. Now, peace is not proved by the absence of conflict; it’s defined by an inner stillness. The reason why you would want to be led of the Spirit is because peace is the result. The Spirit gives peace to those who are being led. Peace is found in His presence and within His satisfaction. Peace is union with God. Peace is not simply attained by setting up “peaceful” circumstances but rather by living in His pleasure. Oh, that’ll sure curl the lip of a legalist! Many believe that if they align their situation in a particular order that they’ll be able to master peace. This just isn’t the case. When the Spirit aligns my circumstances, then I will experience His peace. The friend who I referenced in my last post asked if he was following man too closely. What he was looking for was soul peace and safety. He was looking to please the Lord and not be out of line or in idolatry. But the place he’s reaching for is only found by walking in the Spirit. Peace is the reward of following the Spirit, and Peace is the very presence of His Life and Will in my life. 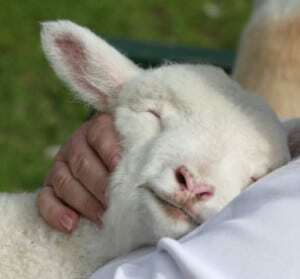 As an earthly shepherd, I laid out peace to bring about health, safety, well-being, and contentment. If I didn’t set up this order, I could expect illness, parasites, disease and injury. Well, our Heavenly Shepherd too sets up circumstance for us. This doesn’t always mean I won’t have conflict or pain, but what it does assure is that I will have an inner stillness that I am in His will and pleasure. Yes, to follow the Spirit means that my internal world will be maintained in peace even if my external world might be in disorder. The Peace experienced by those who are walking in the Spirit is transcendent. Peace is above all, and He takes me above all, too. Peace can be known in any situation, simply because we know we are right with God. Then you will experience God’s peace, which exceeds anything we can understand. His peace will guard your hearts and minds as you live in Christ Jesus. John I enjoying learning about your Shepherding. As I have begun grandparenting I am able to notice the same truth regarding how my internal state and communication affects my grandchildren. It is a lesson that if we could implement in our fearful world replacing love and peace with our children we would see the multitude of childhood fearful behaviors decrease dramatically! The Spirit gives peace to those who are being led. Peace is found in His presence and within His satisfaction. Peace is union with God. Peace is not simply attained by setting up “peaceful” circumstances but rather by living in His pleasure. Oh, that’ll sure curl the lip of a legalist!